Strategic exit for a substantial private food manufacturer. Our client had built a successful and profitable company selling snack cakes to the in-store bakeries of the UK’s largest retailers. With sales of more than £12 million per year and approaching 100 staff the company was poised for further growth but securing this growth would require considerable investment in commercial and administrative resources. When he first approached Selling Private Companies our client was undecided about the way forward. Although the company could easily afford the necessary investment, might it not be better to sell to a larger company with these resources already in place? The client accepted our proposal to conduct an international search for a bakery company with the resources to take Classic Cakes forward. We approached over 50 major bakers in the UK, Western Europe and North America. Of these 14 companies signed our confidentiality agreement and took the detailed sale memorandum and financial forecasts. We received 3 offers for the company and decided to accepts an offer from CSM NV. Headquartered in the Netherlands. 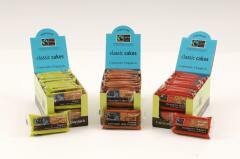 CSM are one of the worlds largest manufacturers of baked goods and bakery ingredients.